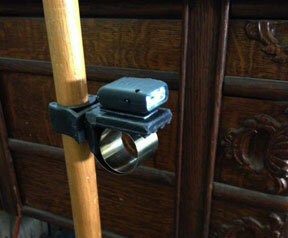 Clamp your walking cane to a table or any projecting surface whether it is horizontal, vertical or diagonal! PRICE INCLUDES SHIPPING! Just use the word CLAMP as a coupon code at checkout! Clamps to the table. Clamps to your chair. Clamps to handicap grab bars. Clamps to anything up to 5" thick! Here's The Cane Clamp with a flashlight attached to the shelf using sticky-backed hook and loop connectors (Velcro). 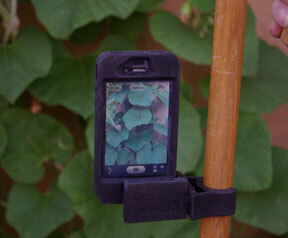 And, another photo demonstrates The Cane Clamp as a smart phone holder. No need to remove the clamp from your cane. It has many uses! Patent # US 9,307,855,B2 issued April 12, 2016.